The NFL announced this year's list of free Hawaiian vacation recipients, and there are only three Steelers among them: LB James Harrison and S Troy Polamalu are starters, joined by reserve LB James Farrior. Several Steeler teammates will probably be asked when their NFL brethren beg out of the game in vintage Tom Brady fashion, so that number will likely increase. There weren't many surprises omissions other than DE Aaron Smith, who is clearly not flashy enough to be noticed but is certainly deserving. A case could be made for LB Lamarr Woodley, but linebacker is a tough nut to crack, and he will likely have many more chances. It's no shock that the offense was totally ignored. Ben Roethlisberger has put up victories (which is all that really matters), but in a fantasy-league culture, that's not enough for something like this. No running back nor receiver did enough, and I won't bother to entertain the notion that any of their linemen should be there. So we're left with three, which says a lot about the job Mike Tomlin has done in 2008. Injuries, schedules, mini-controversies, ownership issues, free agent defections...these have not taken the Steelers' eyes off the prize, and that starts at the top. As for the rest of the rosters, one thing that jumps out is the presence of four former Steelers: G Alan Faneca, LB Joey Porter, S Chris Hope, and special-teamer Sean Morey. We'll also be seeing two former Pitt Panthers, WR Larry Fitzgerald and DB Darrelle Revis. That is, if any of us actually watch the Pro Bowl. Woodley's numbers are essentially the same as Suggs, but with 4 more sacks. Jay Cutler, really? Jay Cutler...I just can't buy that. Tell me I'm not the only one that gets irritated when Jeff Reed never makes this thing. He's as accurate and clutch as any kicker in the league, especially last year. 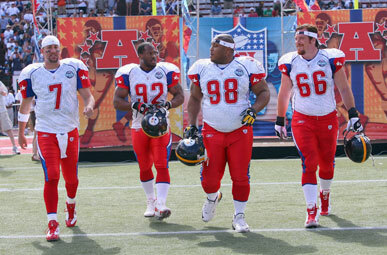 Its almost a good thing the Steelers don't have too many Pro Bowl-ers. Don't mean to offend, but can those uniforms look any gay-er?